Have an energetic kid at home who would love a birthday full of an adrenaline rush? For a super active kid, there’s nothing better than a place to unleash his/her energy in physical activities or have an exciting match between friends. Bangalore is bustling with turfs that support an energetic birthday experience. Your little monkeys will be delighted with the 16 modular climbing walls here. Along with auto belay devices, each of the climbing challenges is so exciting that even an adult would have equal fun. They have exciting party packages that include climbing sessions. Do check it out! Is scoring a goal easy peasy for your soccer champ? Well then, this birthday let him/her try scoring one on soapy terrains? Yes, this is indeed a fun (and safe) activity that will keep all the kids entertained and happy through the session. With facilities like a zip line, trampoline, climbing nets, tree deck, basketball, cricket and lots more, your kids’ friends will leave with a happy smile on their faces. Note, PlayGym will help you with just the basic decoration, although you’re free to use a third party for party decor. Play on the trampoline or even indoor cricket or football here. The most exciting part is the huge outdoor beach facility where kids can choose to play up to 8 exciting beach games. You can customize their birthday packages and hire services like a tattoo artist, puppet show, storytelling, and more. Is your child a crazy fan of virtual reality games? Then, this is the place to consider for your loved ones to celebrate their special day. With some excellent range of gaming activities like the Flymax, Lazer maze, virtual cricket, Twilight bowling and much more, this place offers an unmatched experience. They have several birthday packages to suit your child’s age and needs. The PLaY Juniors at PLaY arena is a children’s activity centre that’s an ideal place to host your kids’ birthday parties. Choose from a mix of indoor and outdoor games like climbing, shooting, soccer, bike racing, and more to keep the little ones bustling with energy and happiness. Wrap yourself in a huge bubble ball and then try to score a goal without dashing into your teammates. Sounds crazy? It’s as much fun too. Now imagine having such a sport as your kid’s birthday theme? Don’t you think they’ll have a blast? Choose between two exciting packages. A venue that has bowling, air hockey, foosball, F1 racing, Play station lounge and awesome food cannot go wrong for a kid’s birthday party. In fact, the adults can equally have a ball along with the little ones. They have two locations: One in Malleswaram and the other in Whitefield. With an excellent bowling alley facility, Amoeba also offers 3D games, racing cars, and other virtual reality games making it a great place to host your kids’ birthday parties. With an array of exciting games and packages, it’s a fit for all age groups. They have branches in 7 locations across the city. Do check out their website to know more. How about a horse riding experience as a birthday treat? The open space and a green cover provide a lovely and unique ambiance. Apart from the connect with Nature, the kids will get a 15-20 ride on the well-bred horses under the supervision of able trainers. Other party elements would require a third party vendor as they do not offer any other service. This is one of the largest indoor rock climbing facilities in the country. Your kids can have an exciting match on their birthday with friends and have a rocking birthday, literally! Whether you choose to play football the usual way or wrapped in a bubble, this place offers complete entertainment. Book the pitch on special occasions. Let your kids and their entourage fight it out while you cheer them from the stands. Make it a memorable event for them. An arena that offers facility for football, cricket, volleyball and horse riding. 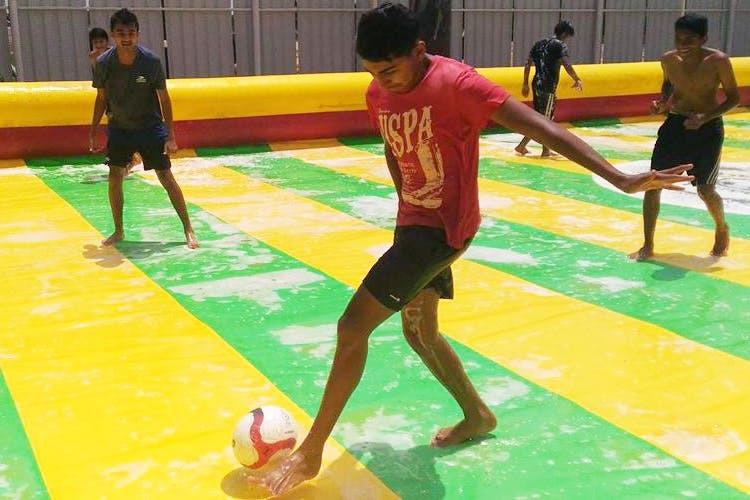 With an open air venue ground, the place is just perfect for sports-themed birthday parties. How about an icy cold birthday party for the little monsters? Skate or slide in the ice skating arena and have unlimited fun at this play area where they maintain the ice at sub-zero temperatures using technology from Netherlands. This post first appeared on Buzzing Bubs here.